Gladiator Training | What song the Sirens sang . . . When you mention Gladiator training to people today, they immediately reference the movies Spartacus and Gladiator. Why is that? The actors who portrayed these gladiators of ancient Rome resembled the real thing, physically, at least. The first step in entering a Ludus was being in both fine physical shape, to withstand the training and fights, and be attractive to the masses. Gladiators were both slaves and freemen, who elected to renounce their social status. Before entering training a novice first had to swear an oath agreeing to endure both humiliation and death with honor. After signing a contract agreeing on a monetary value and the amounts of fights per year, he was then evaluated for what style of fighting he would best be suited for. Once the fighting style was chosen the novice would then be assigned to a weapons specialist, normally ex-gladiators who could no longer fight. Under the care of this specialist, the novice would spend almost every waking moment in the training yard learning the fighting technique, repeating the movements over and over until they knew them automatically. As their skill progressed, they were moved from practicing with wooden weapons against a wooden pole to blunted weapons against other trainees. These men would practice until they literally dropped from exhaustion daily. 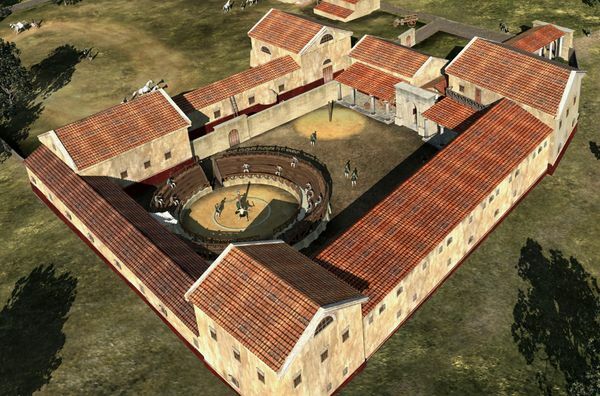 Archeologists are continuously uncovering more and more information about the training camps of the gladiator. From a gladiator cemetery, outside of Turkey, they are learning more on how they died and injuries sustained while both training and fighting. The equipment used has been uncovered from a Ludus in Pompeii, and a new Ludus has been discovered in Austria, intact. As we continue to learn more about these athletes of the ancient world, our desire to know more ever increases over time. The Ludi are best compared to the NFL training camps of today, and these gladiators are best compared to our toughest football players, only our athletes do not have to face death in the arena. and South 102, no. 2 (Dec-Jan., 2006/2007). http://www.jstor.org/stable/30038038. (accessed Sept 18, 2011). Curry, Andrew. 2008. The Gladiator Diet. Archeology 61, no. 6 (Nov-Dec., 2008). 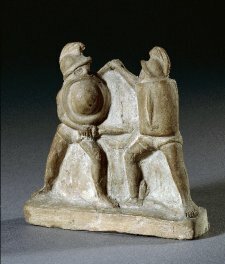 http://www.archaeology.org/0811/abstracts/gladiator.html (accessed Sept 18, 2011). Meijer, Fik. 2003. The Gladiators: History’s Most Deadly Sport. New York: Thomas Dunne Books. ancient-walmarts-science/ (accessed Sept 18, 2011). Hmmm… I would maybe compare these Gladiators to modern day WWE Wrestlers. They each have to appeal to the audience in some way. There are different guys with different roles. They have extensive training that they put into their hour or two of entertainment (just a thought). It is crazy to think that people volunteered for this. Sad to think they would put thier lives on the line just to be fed each day. Interesting, was there a time line in which the trainee had to advance to the arena? If not then would some try not to go, drag their feet? If yes, how long. I would compair their traning to that of a Matador, knowing they will receive adoration and applause for surviving in the arena.